FRIDAY, Jan. 5, 2018 (HealthDay News) — This past year was a busy, productive one for diabetes research and care. “2017 was a year of progress in our understanding of diabetes and its complications, the tools available to help people manage their diabetes, and attention to the economic and accessibility challenges faced by people with diabetes,” said Dr. William Cefalu, chief scientific and medical officer for the American Diabetes Association (ADA). Probably the biggest and most anticipated news of 2017 was the rollout of the so-called artificial pancreas. Created by Medtronic, the device combines an insulin pump, a continuous glucose monitor and a computer algorithm that measures blood sugar levels and then delivers insulin automatically when those levels rise. Insulin delivery is also temporarily suspended if blood sugar levels drop too low. The device isn’t completely automated yet. People with diabetes still need to know how to count the carbohydrates in their food and enter that information into their insulin pump. And the device still requires people with diabetes to check their blood sugar several times a day and enter that information into the machine — this is known as “calibrating.” The hope is that future versions of the device won’t require these steps. He added that a number of other insulin pump manufacturers and independent companies are working on their own artificial pancreas systems. “Competition is really important and helps drive innovation. The next few years will hold promise,” Kowalski added. Heart disease is a significant concern for people with diabetes. New research suggested that long-term use of metformin could reduce the risk of heart disease in people with type 1 diabetes. Other medications have been linked to a reduced risk of heart disease in people with type 2 diabetes. These include Jardiance, Invokana and Victoza. “Cardiovascular disease is the most deadly and expensive complication of diabetes, and a number of recent studies have shown that certain medications also have a strong protective effect against cardiovascular disease in people at high risk for it,” Cefalu said. The artificial pancreas wasn’t the only innovation in diabetes technology in 2017. 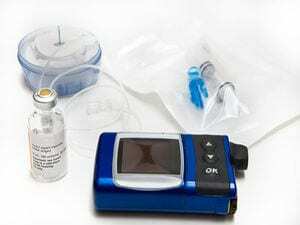 Another continuous glucose monitoring device (CGM) was approved by the U.S. Food and Drug Administration (FDA). Made by Abbott and called the Libre, this device has been in use in Europe for several years. The major difference in the Libre is that you have to request the blood sugar information. Other devices on the market — from Dexcom and Medtronic — send blood sugar information collected by a tiny sensor wire inserted under the skin to a receiver every five minutes or so. The Libre also uses a tiny sensor wire inserted under the skin, but the person with diabetes has to request the information be sent to the receiver. In addition, the Libre also doesn’t require any fingerstick calibration as other devices on the market do. “Some people find the constant information provided by continuous glucose monitors to be stressful. With the Libre, you ask when you want the information. It’s also a little bit flatter than other CGMs, and it comes in at a much lower price point,” Kowalski explained. One of the most promising uses of CGM technology became evident with the publication of the results of an international study of women with type 1 diabetes who wore the devices during pregnancy. Women with type 1 diabetes have to manage their blood sugar levels very tightly during pregnancy, because high blood sugar levels are associated with birth defects and other pregnancy complications. But this also puts them at risk of developing dangerously low blood sugar levels. Women using CGM spent more time in “target” range than women who didn’t. That means their blood sugar was neither too high nor too low for longer periods of time. “This study helped show that mothers and babies do better when the mother [with type 1 diabetes] has a CGM,” Kowalski said. The study was published in The Lancet. Novo Nordisk received FDA approval for a new insulin called Fiasp. This insulin starts working in about 2.5 minutes. Currently, Novolog, another product from Novo Nordisk, takes approximately five to 10 minutes to start working. That difference may not seem like much, but unless people with diabetes who are dependent on insulin inject at least five to 10 minutes before they eat, their blood sugar levels may spike too high after eating. It’s not always possible or even safe to pre-inject insulin. For example, in a restaurant, you have no way of knowing when your food might arrive, and if you pre-inject and your food is late, you can have a dangerously low blood sugar level. The shorter time it takes Fiasp to work could help prevent spikes in blood sugar after eating, which ultimately leads to better diabetes control. The cost of insulin has come under sharp scrutiny recently because the cost of some insulin has tripled in about a decade. Sen. Bernie Sanders (I-Vt.) first brought the issue up during the 2016 presidential campaign. The ADA started a campaign called “Make Insulin Affordable” and is working with members of Congress to bring more attention to the issue. This was also the first year that people on Medicare with diabetes could get coverage for CGMs. Initially, Medicare only offered coverage for the Dexcom CGM, but on Jan. 4 the agency announced that it would also cover the Libre CGM. Learn more about diabetes from the U.S. National Institute of Diabetes and Digestive and Kidney Diseases.